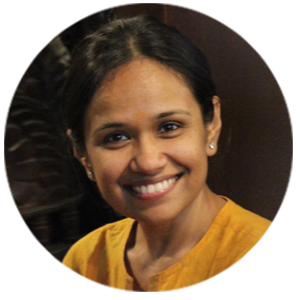 Meghna Banker: early in her life, she felt a call to dedicate her life to service and in her twenties, moved to Gandhi Ashram in Ahmedabad (India) where she is still based. As a gifted filmmaker, graphic designer and artist, Meghna has been a seed behind many projects whose ripples have spread to millions worldwide. Soon after college, she spearheaded "Yes, I Am the Change" series that celebrated small actions of everyday heroes -- where even Amitabh Bachchan was moved to speak at their gala event. Lot of her artwork and design skills can often be seen on billboards in various cities, as a part of an initiative that supports rural artisans. In the last decade, Meghna has been one of the founding pillars behind Moved By Love platform, where she has hosted dozens of "hands, head, heart" retreats -- including Gandhi 3.0, that was attended by the likes of a Noble Peace Laureate, royalty from Japan, and international best-selling authors. More globally, she is a visionary behind six-week "Laddership" circles, to help leaders more effectively lead with love. None of her heArt work carries a price tag, and she is currently in the middle of launching a "Wisdom Crafts" store to invite other artists to step into that shift from transaction to trust. Despite touching so many lives, Meghna stays humbly rooted in "small acts of service". Perhaps what she's most proud of are hosting Awakin Circles in her home, every Wednesday for the last 9 years, to gently nurture people's journeys of inner transformation. At MS University in Baroda, when Meghna was invited to speak about home-schooling her daughter, she gave a stirring reminder that we're all life-long learners: "Actually, both my daughter and I are going to school together." Every day, she remembers a Boddhisattva poem, that mirrors her life-long quest: "May I be a protector to the helpless, a guide to those traveling the path, a boat to those wishing to cross over, a lamp for those in darkness; May I be a servant for the world." Below is a transcript of an interview with Meghna. Why inner transformation? What does it mean to transform? And why is it relevant today? Recently, I was talking to couple friends who are on a walking pilgrimage around the Narmada river. In conversation with them, I reflected how each one of us is in a life long pilgrimage. Some are tangible and some are intangible. And when you are on a pilgrimage, transformation is inevitable. For me, inner transformation has been an ongoing exploration of my own intangible pilgrimage -- a journey of understanding my interconnection with the world, of observing the strength in stillness. It has been a journey of pauses, slowing down and deepening that awareness at the level of mind and matter. I'm not there yet, but I’ve had glimpses of these moments through the process of engaging in small acts of service. To transform is to be able see the light in the ‘other’, to build a union of hearts as Vinoba Bhave would say, while keeping love in the center. Transformation is a natural process I feel, "old as hills" as they say :) The level at which one experiences inner transformation is directly proportional to the level at which one gives, to the level at which one is aware of the dance between the giving and the receiving. Today, the world is getting even more isolated, scarcity is the new ‘usp’ of corporate marketing strategies, and trust is compromised at all levels. Children know how to swipe phones screens, before they can even speak a word. With each new innovation and invention, there’s also new challenges that come our way. That only makes this gap wider. The key to survive through this transition, I feel, is inner transformation. And if we all do that individually and collectively, we may get through -- together -- and we may build a foundation of values for the generations to come, adding to the treasure of wisdom and values that the generations before us have left us with. Is personal transformation akin to "being the best you can be"? Personal transformation, in my limited understanding, is a journey to know yourself better! It is to be able to arrive between the wholesome and the unwholesome; it is to live in harmony with the paradoxes of duality; it is a continuous process of inner cleansing that allows you to be a purer instrument of service. Inner transformation, I feel, happens when we attempt to align our values with the smallest of our actions! In that sense, one's transformation is connected with the well-being of others. I’m reminded of a beautiful statement a wise elder once shared: "Internal meditation is external service and external meditation is internal service." Can you share some tips or steps to make sure my personal transformation is successful? I’m not too sure if transformation can be measured, but it certainly can be experienced. And we can see the process happening when we see those small moments of our own changes, playing out in external circumstances. I'm reminded of a story here, that an elder of our community recently shared in a circle. This elder, known as Arun Dada (now 86) has spent his entire life in service, starting at the age of 19. He has been an intricate part of Bhoodan (the biggest land donation movement in the world) movement with Vinoba Bhave, served in many places experiencing communal tensions, lived his life through the practice of non-violence in a way where he’s never sold his labor. He was also a part of the Shanti Sena (Peace Army) that was initiated by Vinoba ji - which was built on the foundation of non-violence. He served wherever he went and accepted whatever was offered to him. All with a family - wife and 2 kids. When you meet him, you just melt with the love in his eyes for every living being. His humility is his presence. This story packs in enough reminders for me at so many levels to be aware of where I stand in this journey of inner transformation. The question that I hold for myself is, "What can I do to sustain this process?" For me it’s been focusing on wholesome practices like meditation, readings that open my mind to unknown layers of self-knowing, being in noble company that always shows me to my true-north, doing small acts of kindness that allows me to share the merits of generosity with the world, that continues to overflow in my bucket of receiving, and faith in Grace - that all is happening the way it is meant to be. When we are imperfect, our service will be imperfect. But if we wait to be perfect, we may never end up serving. How do you balance inner transformation with external service? I don’t think it is a before/after process. From my experience thus far, I find that they are both interconnected to each other. When I started my journey as a volunteer, my definition of inner transformation was very limited. Perhaps because of the environment that I was raised in and conditioned by. But, deep down I knew that I was pulled to service because it helped me peel some layers of my consciousness. The deeper I went in experiments of service and my own volunteering experience, the more I found my heart opening, which then created ongoing inner transformation and helped me serve in a deeper way. It's a virtuous cycle that feeds into each other. I'm still continuing to uncover deeper and deeper layers as I go. What I've found helpful is to continue to believe in one's own goodness and goodness of others, and with that heart, offer small acts of kindness to whatever is in front of you. Everything else then follows naturally. Is service the purpose of life? As of now, I'm incapable to answer this question. It's a question that I’m still exploring. A question that I continue to remind myself is, "What is my role in connection with the world at large? Who do I have to be in order to serve unconditionally?" The picture that often comes to my mind is that of a flute. For a flute to sound it’s best, it has to be completely hollow and clear from within. The lesser the obstacles inside, the melodious the music on the outside. My effort continues to be like that instrument, like a flute, and to be hollow inside out. I’m not there yet, clearly, but I sense that service will help me get there. How does a spiritual practice help one in the course of personal transformation? A wholesome practice is a great catalyst to keep one grounded. I'm reminded of a conversation between two friends that I had the privilege to hear first hand. One friend asks another, "I get angry very quickly. Small things irritate me no end. I react so often that I completely feel bad about myself. What can I do so that I can respond in a more wholesome way?" This other friend responds, "When you are in a situation where you're reacting with anger, you may not be able to change your behavior right then. You will respond to the degree of your cultivation. But what you can do afterward is take a stronger resolve to increase your awareness. So when a situation like that arises again, you are able to respond to it with love and not react at it with anger." Our spiritual practice helps us shift from a blind reaction to a skilful response, slowly but surely. How does this spiritual practice help one to inculcate a tendency of altruism or selfless service? I’m reminded of a quote by Martin Luther King, Jr., “Everybody can be great, because everybody can serve”. I don’t have a firm answer to that question yet. However I do feel, this whole journey is to be yourself, to know yourself, to be that hollow instrument of service and to know that every single being, every breath, is important. To know that each one can give because each one has a gift that they can serve with. And when everyone comes together through the strengths of their gifts, it builds a deeper ecology of generosity that creates new possibilities. It is about being the shade of the tree, where a pilgrim can rest and go. Some may feel grateful for the shade, and some may not. The sun that brings heat to the pilgrims, also nurtures the tree that gives it shade. And yet, how can we continue to serve without attachment to outcomes? How do we continually regenerate the spirit of service within, while still remembering the ultimate end of all this is to be zero? Through it all, whether we're empty or full, the reward is our own inner transformation! Thank you Meghna for this wonderful reminder. Unpacking wisdom is so difficult yet so you always do it so gracefully. Thank you for all you do to make our world a kinder place, Meghna. What a delight to read about you Meghna. Thank you for the link to Trupti's blog. Wonderful knowing you. Very insightful article.